The more things stay the same, the more they've changed for Sebadoh, which has come up with its most consistent, coherent work yet on Defend Yourself. Of all the comebacks recently mounted by fondly remembered '90s underground faves, Sebadoh's might seem like one of the more difficult propositions. That's not because the group doesn't have the chops, but because the bleeding-heart-on-sleeve sentiments expressed in Lou Barlow's trademark songs seem so tied to a specific time and stage of one's life when perceived slights and psychic wounds could feel so fresh and raw. In other words, how could a band whose music so viscerally captured what it felt like to be brokenhearted in your twenties do the same when they're in their forties and know better than that? And if it's hard enough for a listener to go back through the Sebadoh catalog and hear insecure, lovesick ditties like "Two Years Two Days" and "Willing to Wait" without a slight bit of cringing for identifying with them way back when, how would Barlow approach his exceedingly personal and eviscerating songwriting when he's older and hopefully wiser, with almost a decade-and-a-half of distance from the last Sebadoh album? The more things stay the same, the more they've changed for Barlow and band co-founder Jason Loewenstein on their latest, Defend Yourself, which comes 14 years after their last full-length, 1999's The Sebadoh. So while the subject matter of Barlow's contributions on Defend Yourself are still about missed connections and break-ups, this batch of songs comes after the dissolution of his 25-year marriage, which certainly changes the tenor and context of the lyrics. It's telling, then, that some of Barlow's first lines on the album are "Things have changed / No longer need to be with you / I'm still the same / And if it's leaving I must do, to be true / I will." Even if these sentiments from "I Will" evoke, at least on paper, the heartbreak of his earlier songs, Barlow's insight and how he delivers it reveal a kind of recognition and understanding that shows how much he's grown, matched by the natural flow of the music that helps him avoid indulging in the bitter agitation or the forlorn introspection that he's been known for. Even more piercingly aware is the appropriately cathartic indie-folk diary entry "Let It Out", on which Barlow comes to terms with his situation rather than fight it, singing "I knew how far and fast we might fall / Still I'm holding on to whatever turns me on / The promise of a new familiar way" with a well-earned sense of knowing that doesn't get mired in crippling self-doubt and frustration as his songwriting persona often had in the past. In short, Defend Yourself is less a comeback to the way things were for Sebadoh than a reinvention, a rebirth. If Sebadoh's revival has a precedent, it would actually be Barlow's other gig Dinosaur Jr., in that both bands have come up with new material that's shockingly vital, recalling what made 'em great in the first place without retracing earlier steps or going through the motions. Sebadoh's new familiar way, to riff off Barlow's own words, is reflected in the approach the group took to making the album, tapping its DIY roots and self-producing Defend Yourself on a shoestring budget, yet somehow coming up with as full and rich a sound as it ever has. Barlow tracks like "I Will" and punk-pop romper "Love You Here" have muscular melodies that probably would've broken Sebadoh into the mainstream as they should've when they were post-grunge next big things. The fruits of this new approach are even more evident on Loewenstein's offerings, like on the buzzy "Beat" and the twang punk of "Can't Depend", which still bound and radiate with his eccentric energy, just with a more pronounced sense of structure than his tracks possessed before. And to top it all off, the Barlow-led numbers and the Loewenstein-penned ones have never sounded more complementary -- notice, especially, how Loewenstein's "Inquiries" and Barlow's "State of Mine" go back-to-back and hand-in-hand with each other by playing to each songwriter's strengths, the former an off-kilter experimental punk rave-up and the latter a straight-up indie charmer. All in all, you could say that this more settled perspective is channeled into a mature album that's more fleshed out from beginning to end than previous Sebadoh outings, with a noticeably higher level of complexity whether you're talking about the grown-up themes Barlow and Loewenstein tackle or the greater confidence and consistency in Sebadoh's eclectic indie sound. But in the case of Defend Yourself, more mature doesn't mean Sebadoh's gone adult alternative or dad-rock on you -- you certainly wouldn't get that impression from the imposing guitar-and-bass of the title track or the headlong indie-punkabilly of "Oxygen", as the music still bristles and crackles in the right places. Take "State of Mine" as the best example of Sebadoh's new state of mind, as it circles with the energy of mosh-ready punk-pop piece at the same time it manages to show how Barlow has grown older gracefully, pondering, "To let the children grow / To feel it themselves / To hurt and grow / It's the hardest thing I've ever done and I haven't done it yet." Likewise, Loewenstein digs deeper in his own way, dealing with relationships in a more existential fashion on what might be his most streamlined song yet, "Final Days", where he growls, "Making everything so complex / Absence of reason / Intrigued by mystery / Ignored by history." That Sebadoh could come up with an album that's as engaging as its work from its heyday speaks to how Barlow and Loewenstein haven't just persevered, but have thrived from going though what they've gone through. Even more impressive is that Defend Yourself might just be Sebadoh's most consistent and coherent effort yet, suggesting that they've dealt with anxiety, insecurity, and uncertainty by getting their act together instead of tearing down everything -- and everyone -- around them like before. 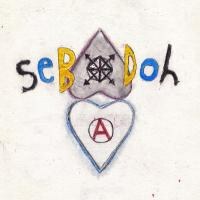 Perhaps that's the promise of a new familiar way that Sebadoh makes good on with Defend Yourself both thematically and musically, finding something to build on at last, after all the years.